There’s no other way to say it: I absolutely love to rock a gallery wall. It’s such an easy way to put all of your art, photos and mementos together without having to worry to much about design rules or guidelines. I used to fuss and worry about my art at home a lot. My partner would always say, “just put it all up”, and to his credit, it worked; a gallery wall in my entryway was the result and I love to look at it when I’m going in or out. When it comes to gallery wall ideas, I prefer to place them in entryways as opposed to living spaces. Entryways and hallways are such forgotten zones; areas we pass through without much thought of what’s going on in them style-wise. By putting a gallery wall here, it allows you to pause, take a moment, appreciate some art or remember a special family memory. And besides, who wants a gallery wall of relatives eyeballs staring down at you from your bedroom wall as you sleep? This is why I prefer to have larger art pieces in these zones and keep the gallery walls for the hallway and entryways. But that’s just me. 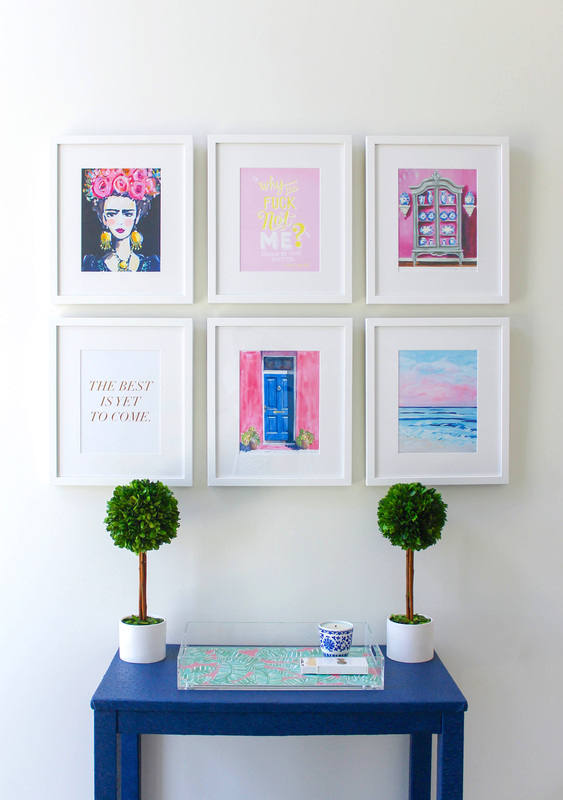 There are endless options with it comes to gallery wall ideas, but these ones are my fave. PS: The hero image in this post is via Freedom. Gorg right?! Any room that features a lot of symmetry is going to create a sense of formality, so if you prefer a space that feels more formal, structured and balanced, a symmetrical gallery wall is a great idea. There are endless options in terms of the number of frames you place on the wall and what size they are. But of course, the golden rule is that you need to ensure each frame is perfectly mirrored by another. This is my favourite type of gallery wall because it is anything goes and feels completely relaxed in terms of its application. The best part is that there’s no start of end point, and you can simply add more frames as you please. You also don’t have to be too concerned with where you place your hooks, either; the more haphazard the placement of each artwork, the better. What I will say here is that you do need to ensure your frames are in different colours and made from different materials, and that the gallery also features portrait and landscape orientations. Also ensure the frames are not put too closely together or the wall starts to feel suffocated. Image Credit. This gallery wall idea gives you the best of both worlds in that it gives you the ease of a random formation, but serves up a sense or order, too. Notice that the external border of this gallery wall features clean lines (one giant rectangle) but inside that shape the frames are randomly placed. It gives you a bit of structure but ensures there are very clear boundaries, too, so that it’s obvious where the art wall ends. This one will also require some planning, though, because you need your the edge of every frame to perfectly line up with the others that sit on the edge of the installation. Image Credit. I love to take the eye on a horizontal journey in any room. I’m a firm believe that when you’re in a space, you need to go on a visual journey and lead the eye around the room. A horizontal gallery wall like the one above is a great way to do this – especially in a hallway. I have one like this in my own home and adore it. It runs over a side table I have in my entryway and is successful in leading you down to other rooms in the house. You can place the art in a straight line or hang them randomly, too, so there’s a sense of freedom and choice at play here. Image Credit. So many of us have character-filled homes with odd pockets in them. It might be a stretch of wall under a staircase, or a corner that wraps around one room to lead you to another. In spaces like this, a smaller gallery wall is a fantastic idea because it turns an otherwise dead area into a feature moment. I love the idea of wrapping art around a corner like you see in the photo above. If you’re going to try this, though, I would recommend the artwork be positioned randomly, in large scale and that you carefully consider the number of frames you hang. 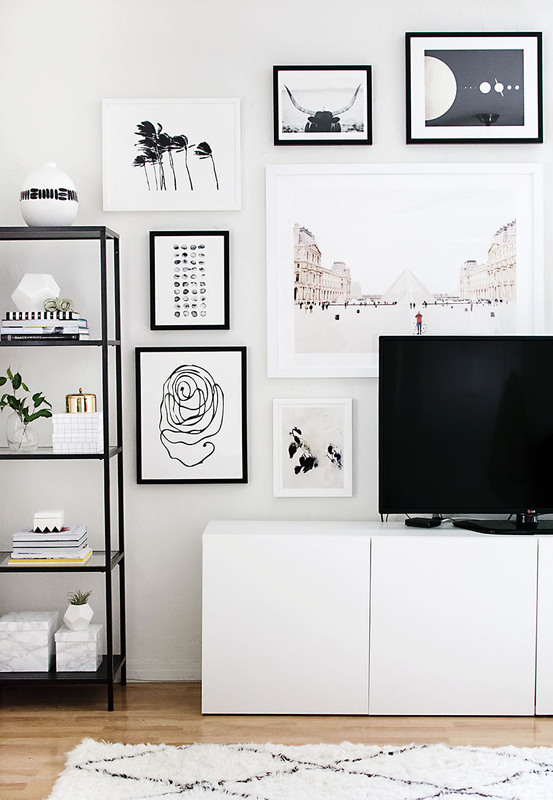 Less is more with this idea, so don’t go too overboard with a lot of smaller frames. Image Credit. We’ve been trying to find ways to camouflage our TV sets for years, and thankfully the gallery wall has come to the rescue. This sort of random formation around the television set is a really nice way to make the dominant blackness of the set retreat a little, visually speaking. My advice for pulling this look off is to ensure you have at least one artwork that’s of a similar size to the TV set. Use that as the anchor artwork (placed to one side of the TV) and then use smaller pieces around it in varying sizes, placed a decent width apart. Image Credit. The concept here is a fairly obvious one, so I won’t go into too much detail, but I just wanted to acknowledge the beauty in keeping it simple. The gallery wall above is a monochromatic colour story, with each piece feeling carefully considered. I also like that there’s a mix of media here; photos of landscapes, adventures, animals, abstract artwork and more. Each piece can standalone as a statement artwork and yet they all speak to one another because of the similar colour palette. Chic to the max! Image Credit. If you’re a bit of an art lover and can’t help but buy it on a regular basis (I hear you! 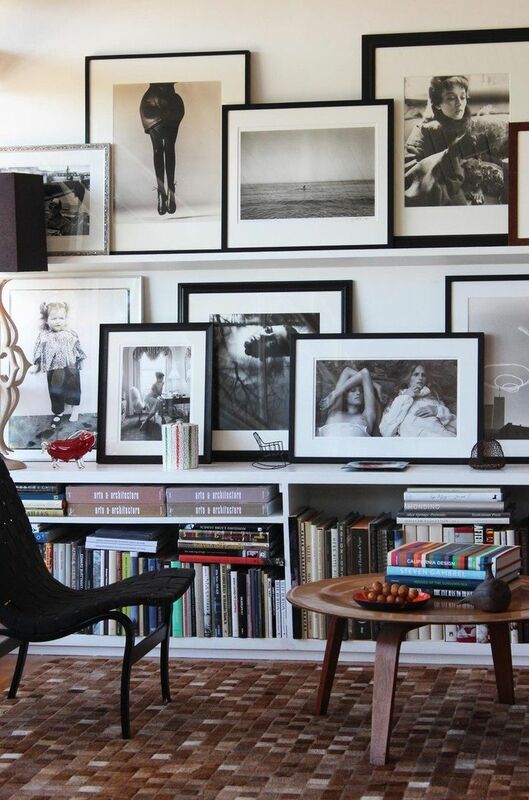 ), you might want to consider a gallery wall that utilises picture ledges, like the one above. You can either place one picture ledge above a buffet or sideboard, or you can install multiple ledges on the wall, one above the other. It’s totally up to you, but the thing that I find most appealing is the ability to bring art in and out of the space with ease, and with minimal hooks involved. The leaning of the artworks also makes the space feel relaxed, but completely eye-catching at the same time. Image Credit. I’m a renter myself, so I’m always pained to see heavy artworks on walls, knowing that I can’t hang them in a similar style in my own space. That said, a lot of the galley wall ideas in this post can be implemented with 3M hooks or similar, which go onto the wall with ease and can be pulled off without ripping the paint off with it. Another idea, which I do in my own home, is to lean artworks along the top of a shelf or sideboard like you see above. I tend to do this with the heavier artworks in my home that I know the 3M hooks aren’t tough enough to hold. It’s a bit of a happy medium idea, until you get into your own place and can then hang them on your wall without a worry! Image Credit. Lastly, I just wanted to touch on one of the added bonuses of using a gallery wall at home. Now, I often rave about using bold paint colours on walls (more on that here), but if you’re worried about giving it a go, or you’ve done so and the colour feels rather dominant, you can use a gallery wall to mask some of the heaviness of the hue. In the photo above, imagine the bold blue wall without all the artwork on it. Rather visually dominant, right? By adding all of those frames, it takes some of the dominance away. In fact, the deep brown frames and blue wall play really well together, giving the space depth and character. Just an added tip I thought I’d throw in for you 😉 Image Credit. Which of these 10 gallery wall ideas is your favourite? Will you try any? Drop me a comment below and let’s discuss what’s working for you! Wow! I am completely in love with your blog! This is a fabulous read!! !